HPrunning Jason Polydoris Qualifies For State Cross Country Meet! 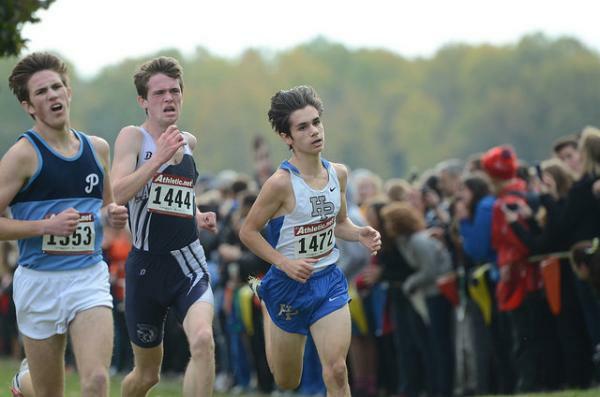 The Giants once again had a meet with mixed emotions at the IHSA 3A Hoffman Estates Cross Country Sectional. 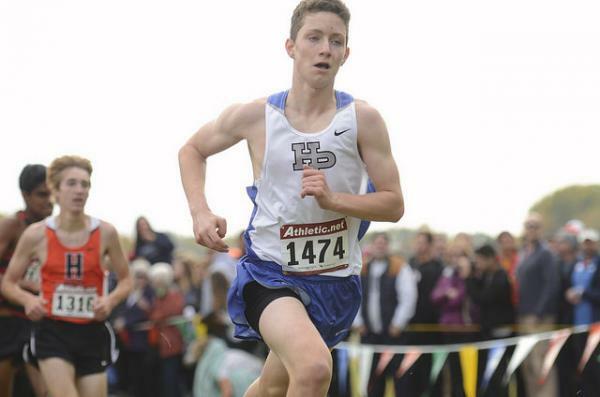 After losing his shoe in the Regional Meet the previous weekend and possibly not making it to Sectionals, sophomore Jason Polydoris made the most of his opportunity to race again. He took a risk and got out aggressively and came through the mile with his fastest ever first mile split of 4:49. After giving back some in the second mile, Polydoris ran an extremely strong final mile with a split of 5:03. His final 400 was a battle for a qualifying spot and he was able to pass and hold off key runners to finish in 15th place. His finish and personal best time of 15:05.7 earned Jason a qualifying spot for the IHSA 3A State Meet! This is an incredible accomplishment, especially given he is only a sophomore. Despite being the 38th returner from last year’s Sectional Meet, Jason showed the difference that just one year of hard work and commitment can make. Training truly beats talent over time. This is the 9th year in a row in which the HPHS Boys Cross Country Program has had the team or an individual qualify for the State Meet. Of the boys teams able to qualify for this Sectional, only Highland Park and Lake Zurich have had State qualifiers the past 9 straight years. Senior Jose Reyes was coming off of one of the best races of his distinguished career, winning the Regional Meet the week before. 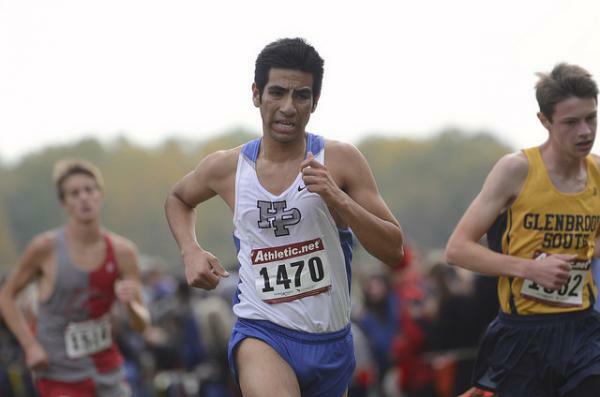 At Sectionals Reyes got out very well, but during the second mile he began to struggle. Polydoris caught up to Reyes at the two mile and everyone hoped they would stay together and both qualify for the State Meet. On this day, Reyes did not have his usual confident stride. He was unable to hold the pace and faded in the final mile. It was difficult for all to watch because Jose is one of the most well-respected runners and very deserving of making it to the State Meet. This amazing young man has given so much to the HP team, program, and the sport itself. He is respected and admired by teammates, coaches, competitors, teachers, friends, spectators, and everyone he interacts with. He makes those around him better not just as runners but as people. Sport can be extremely rewarding, but it can also bring painful experiences. Adversity can teach athletes so much, but in the moment it can be emotional and difficult to understand why. Jose will overcome this challenge as he always does when faced with adversity. All those that know Jose are heartbroken for him and wish him the very best in all his future endeavors. “We are neither defined by our successes nor our shortcomings; but rather by who we are.” -Author Unknown. Jose will go down in the programs history as one of the greatest leaders, teammates, and athletes. Everyone is so proud of the young man Jose Reyes has become. Freshmen Alex Brown ran his best race. He finally got out aggressively in the first mile and that payed off big time for the talented freshmen. He continued to hold on well throughout the race. He also had one of his strongest finishes in the final 400. He was able to come across the line with a personal best 16:05.1. This was a great experience for Alex as he hopes to improve on this finish with aspirations to qualify for State next year. To accomplish that he will have to take his commitment to a new level and make sure to take care of every detail no matter how small it may seem. If he does that, he has an opportunity to become one of the all-time greats in HP history.